ELVIS IS IN THE BUILDING! Joseph Hall is thrilled to be bringing his award winning Elvis Rock N Remember tribute show to a venue near you. his show is directed in such a manner that really shows the roots of Elvis’ musical career, it will make it difficult for you to stay in your seat. He caters to both the young and the young at heart. He's got the look, the voice, the charm and the moves that take us back to a time when parents were flabbergasted by the flauntingly provocative hip action. In Hall's Elvis Rock N Remember show he achieves a powerful flashback experience to the moment when fans fell in love with the high spirited young man that was Elvis Presley. His show will take you thru a journey of Elvis hits from rock n roll, to country, pop, rhythm & blues and gospel. With a heartfelt tribute to our veterans and even the teddy bears and scarves to woo the ladies, this show has got it all! Hall’s Elvis Rock N Remember show is must see for all ages! 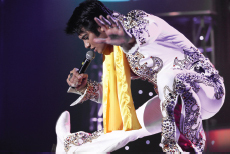 Joseph Hall, born in 1984 has been paying tribute to the legacy of Elvis Presley since 2006. He starred on NBC's America's Got Talent in 2008, making 6 TV appearances, viewed by more than 90 million people and placing as one of the top 10 finalists! Sharon Osbourne, " I've got shoes older than you, but I'de like to try you on!" Also, Piers Morgan was quoted as saying, " ELVIS IS BACK!" Joseph Hall has performed all over the world from Las Vegas, Nevada to Porthcawl, Wales. Joseph Hall has won accolades throughout his young career including the "Spirit of Elvis “ award which was presented to him by Elvis Presley’s road manager Charles Stone. Joseph Hall has worked with Elvis Presley Enterprises, Legends in Concert, and has officially been recognized as one of the top tribute artists in the world today. Hall says “ I am so thankful for the life I have, I enjoy my work to the fullest. I love getting the chance to entertain fans and hear their Elvis stories. My goal is simply to capture the essence of Elvis Presley, to pay tribute with the upmost respect to his legacy, his music, his image and above all else his fans." “A basket maker and porcupine quillworker, Yvonne Walker Keshick creates birchbark masterpieces realistically decorated with quills that depict natural images as well as cultural symbols of the Odawa tribe. Also a devoted teacher, she has developed resources and provided instruction to ensure this art form is passed down to others as it was to her. 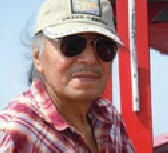 Keshick was born in 1946 and is descended from a long line of Odawa/Ojibwa quillworkers. Keshick's aunt, Anna Odei'min, was reputedly on the of the finest quillworkers at the turn of the 19th century. In 1969, Keshick began learning the art from teacher and artist, Susan Kiogima Shagonaby. Keshick quickly mastered both the traditional cultural designs as well as the basic wildlife and floral designs for which her family was known and which are passed down from generation to generation. She then excelled in creating even more complex and realistic designs of flora and fauna as well as depictions of cultural symbols and stories. Her work is known for its technical craftsmanship—the quality of material used, the uniformity of sewing, and the accuracy of the forms and fits of boxes and covers. Keshick avoids using dyed quills in her work and instead creates shadowing affects using the natural colors of the quills. Keshick is also knowledgeable in the stories and traditions associated with quillwork and her culture, which she shares with her community and family. Keshick has said, "I believe it is truly our responsibility to teach others all of the best things of our culture" and in that vein has passed along the tradition to her sons and daughter. 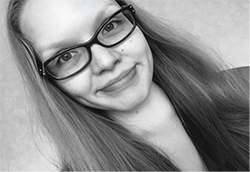 She participated in Michigan Traditional Arts Apprenticeship Program and has also written a manuscript that coves instructions on making quillwork and information on the cultural meanings related to quillwork. As a photographer, I capture nature in a simplistic manner. In order to take nature photographs I have to become part of nature itself. It is delicate work that takes time and patience. My Ojibway culture inspires my photography. Birds and turtles are part of our ancient clan system that we identify with. Some images, such as the sun rising or a summer moon, are names that are given to us in Naming Ceremonies and another way in which we identify with the natural world. My work is one snapshot at a time, that is frozen for eternity. I study my subjects and notice the fine details long after they are gone. I like to enhance the colors of my photographs to make them more dramatic. The challenge, as with any important decision, is to decide which photographs get to live and speak to the world in a way that only nature intends. Growing up, I was immersed in the Disney culture through toys, movies, places, etc. My parents introduced me to the most magical places...Disney World and Disneyland. Watching their movies has always put a smile on my face, which was the intent of Walt Disney himself. The photographs in my presentation are from two different time periods, 1955 (Disneyland’s opening day) and 2015 (when I visited), which shows how the magic of Walt Disney's imagination has lasted. We both believe(d) that all of the artists and builders of the world can actually change it through the active use of imagination. 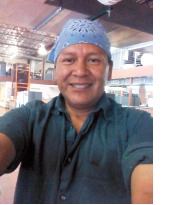 Ricardo Caté is from Santo Domingo Pueblo in New Mexico. He is the father of three and a former Marine. He taught 7th & 8th grade Social Studies for a few years and GED classes in 2011-2012. He also teaches art classes to youth during the summer. 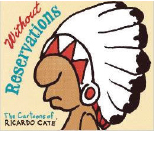 Caté has been cartooning since 7th grade and drawing the cartoon “Without Reservations,” for the Santa Fe New Mexican newspaper for 8 years. 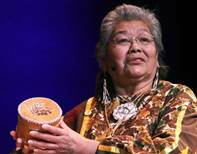 Annette S. Lee is a professional artist and astronomer who is also mixed-race Dakota-Sioux. Recently she painted/co-painted two well-received Native star maps: Ojibwe Giizhig Anung Massingaagan and Dakota Wichanpi Wowapi Makoce. 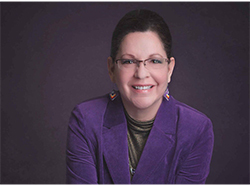 Annette taught art full time for four years at Fond du Lac Tribal & Community College. 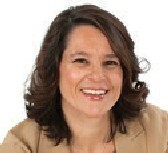 She is currently a Professor of Astronomy & Physics at St. Cloud State University and Director of the Native Skywatchers research and programming. William Wilson is Ojibwe from Ontario, Canada near Lake Nipigon (Animbigon Zaaga’igan – All you see is water). He was born and raised at his grandparent’s house, everyday speaking Ojibwe and living in a traditional way. Winter camp, snowshoeing, trapping, fishing, moose hunting and blueberry picking were a part of everyday life. William paints brightly colored, traditionally inspired, Ojibwe style X-ray paintings. His artwork is motivated by his close connection to culture and dreams. 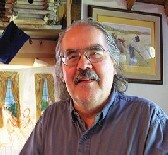 William taught for several years at an Ojibwe Culture immersion school in Wisconsin. Currently William is a culture and language consultant for Fond du Lac Tribal & Community College and a Native Skywatchers team-member. Jeff Tibbetts (Gaagige Giizhig) (Ojibwe) is from the Fond du Lac Indian Reservation (Nagaajiwanaang) located in Northern Minnesota. 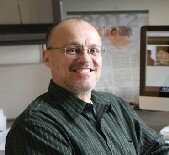 Currently, he is the Title III Project Director at the Fond du Lac Tribal and Community College. Jeffrey has been affiliated with the Native Skywatchers for several years. He is a self-taught artist who uses various materials for self-expression. He creates sculptures in wood, bone, or stone but has also used alternative methods and found materials, such as rusty cans, wire, old calendars or photos and blue glass in some of his work.